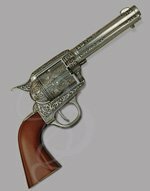 Let's face it, you can't have a gunfighter pistol without also having a holster. It's like having a bicycle with no wheels. Shoes with no laces. A 40-watt plasma rifle with no photon repeaters. You get the point. These holsters are made by master craftsmen in Spain from some of the finest leather available. 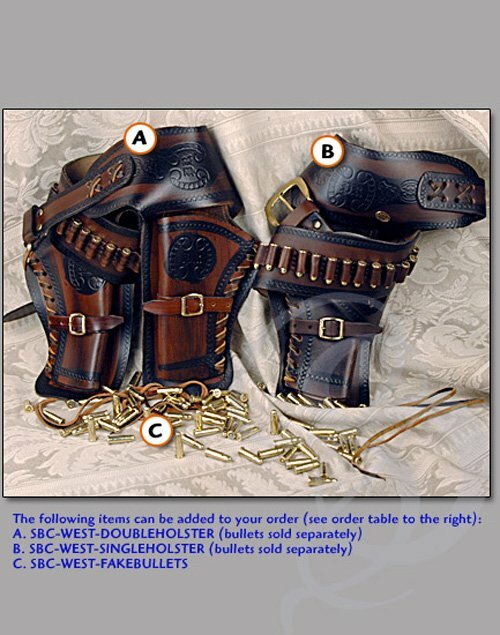 They feature bandolier style belts that can showcase your bullet collection nicely (fake bullets sold separately). They come with attached leather thongs that allow the holsters to be strapped securely to your thigh for solid, stable performance in gun draws. These holsters look fantastic, and let me tell you, there are very few feelings quite like the feeling of drawing a cowboy revolver out of a holster. It doesn't matter how old you are. Drawing a revolver out of one of these will bring you back to your childhood. We are not responsible for addictions that may be caused by these. So, if you end up wearing one of these holsters around everywhere you go like that girl Tootie wore roller skates on The Facts of Life t.v. show, it's not our fault. You have been warned. Materials: Burnished and Tooled Leather.